Kalafatis (Kalafati) Mykonos: Kalafatis is known for its water sports in Mykonos. This is very much an active beach. In the left corner of the beach one can find a hut with hire facilities from a snorkel to diving. There is also a windsurf centre, where you can rent a board by hour, and a watersports centre for jet ski. Kalafatis (Kalafati) is an organized beach with trees which provide natural shade and turquoise waters in Mykonos island. If you come to this beach it’s like coming to another island. It’s very un-mykonian. This is where you get away from the crowds and find your rest. Kalafatis is a very long stretch of sand with some hotels on one side and a little authentic, charming Greek village on the other side. Also here there are a few rooms for rent. I just LOVED it. The little village comes with a beautiful harbour with kaiks and yet another small beach. There are one or two taverna’s and that’s it. Kalafatis has a connection by bus to the capital Mykonos Town a couple of times a day, so not every hour or half an hour like some of the other villages and beaches on Mykonos island. We’ve been there a couple of times and came by bus. The first time I got off the bus at Ano Mera and walked the island towards Kalafatis Beach, which was quite a pleasent experience. The last bus returning at that time was at 6 o’clock in the evening. I don’t know if that has changed by now. The number of buses might have increased. If you are not staying in Kalafatis and you want to return home later and you don’t have a car or a bike, there is always and option to take a taxi. They are inexpensive in Mykonos. On Kalafatis beach you will see people snorkelling and there is also a windsurfing center here. You can hire a jetski at the beach. 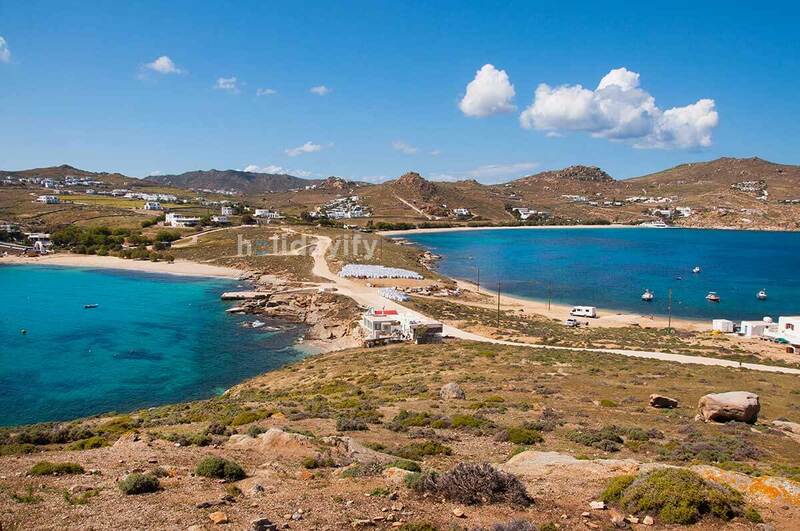 Mykonos recommended hotels near Kalafatis (Kalafati) beach: Kalafatis Traditional House, Villas Kalafatis Apartments, Apollonia apart-hotel, Sea Sky, La Residence Mykonos, Chaniotis Studios, Estiades Apartment and more. Nowadays there are sun beds and umbrellas for rent on the beach (this was different when I was there a couple of years ago, so things have changed), but there is also a section without those facilities. Around Kalafatis Beach are trees where you can find some shade. On a part of the bottom of the sea at Kalafatis Beach there are some sea plants and quite a few small fish are swimming around here, which makes it extra fun for snorkelers.